'Hospital leaders in North Yorkshire' have decided that the NHS doesn't need to bother carrying out operations on the 40 per cent of the population who are smokers and/or obese. This is healthcare they have already paid for, of course, but it goes without saying that they won't be getting any of their taxes back. "Well then, they'll just have to die." Fun fact: DeVille-Almond is now the chair of the British Obesity Society. North Yorkshire's health leaders haven't gone quite as far as her. They have said that they are prepared to continue giving smokers and fat people life-saving operations, but not other operations. That's nice of them, isn't it? They're happy to let them live in pain so long as their condition is not fatal. Rationing healthcare on the basis of lifestyle was never part of the NHS's plan in 1948. It it had been, there would have been even more resistance to the nationalisation of the industry than there was. 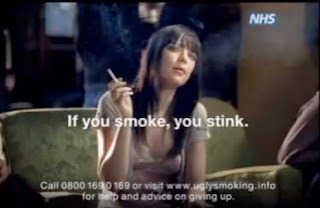 But after years of wrongly scapegoating smokers and fat people for the NHS's spiralling budget, it's no surprise to find the service being turned from a free-at-the-point-of-need Ponzi scheme into a tool of outright coercion and punishment. What once seemed unthinkable has come to pass. It is fitting, then, that today saw the publication of this modest proposal in the Guardian. Meat eaters who enjoy a relaxing cigarette after dinner are prevented from doing so, apparently in their own and others’ best interests, thanks to a blanket ban on smoking. But how can the NHS sensibly ban cigarettes as a known health hazard while simultaneously promoting meat? To endorse one known danger while completely banning a similar one makes no sense. Either it’s OK to allow free choice or it’s OK to prevent “unhealthy behaviours”, but you can’t have it both ways. If you ban smoking you have to ban meat, which causes considerably more damage to animals, the environment and individuals than smoking. If you don’t ban meat, then you can’t ban smoking. Nobody is going to be banning meat in the near future, but that is for political reasons. There are simply too many meat eaters and not enough fanatical vegetarians. It is a question of power, not ethics, and the author of this article - vile authoritarian though he may be - inadvertently makes the libertarian argument very well. If it is the government's business to prevent people taking voluntary, informed risks about one lifestyle choice, there is no reason to stop at smoking. He asks whether it's "OK to allow free choice" or "OK to prevent 'unhealthy behaviour'". In my view, the only moral answer is that it's OK to allow free choice. It is not the government's business. The author obviously disagrees, but I bet it wouldn't take long to find something he likes doing that has been linked to cancer. At least his argument makes more sense than the scatter-gun bigotry of people who argue for state force to be used against activities they don't like while demanding protection for those they do. We are plagued by doublethink because we habitually separate the world into unrelated packets. Smoking is a health issue. Meat is normal. Alcohol is bad. Not allowing tobacco products to be displayed is health promotion. Allowing body parts of slaughtered animals on public view in supermarkets is wholesome. Illogical beliefs appear compatible if their true connections are disguised. Smoking is tightly wrapped in a packet labelled “Very bad for your health”, whereas eating meat is in a quite different packet called “a balanced diet” or “you need your protein”. So long as we see the world in disconnected chunks, we can avoid serious thought, and preserve the status quo. Quite so. Freedom is indivisible. Stand up for it. "Calories are the new tobacco"